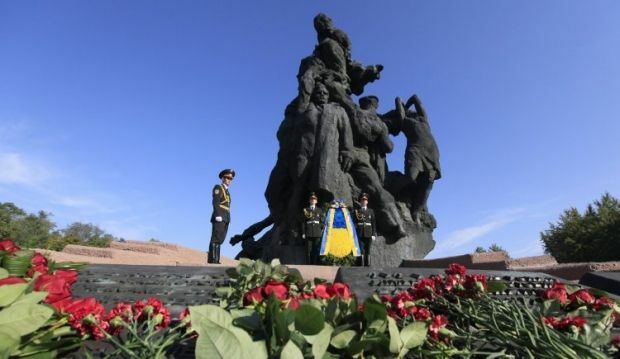 Director of World Jewish Congress: "Millions of Ukrainians fought against Nazis"
The Executive Director of the World Jewish Congress, Israel's Laurence Weinbaum notes the need to honor Ukrainians who fought against the Nazis, according to an UNIAN correspondent. "We came here today to remember the terrible tragedy that befell the Jews of Kyiv and surrounding areas – it is Babii Yar, the 75th anniversary of the events," Weinbaum said at a briefing in Kyiv, adding that "it was Germany's plans to destroy the Jewish people." He noted that there were many difficulties in Ukraine today. "A lot of obstacles. And it will be very difficult to overcome these problems," he said and thanked the Ukrainian authorities for the organization of ceremonies. Read alsoShimon Peres, former Israeli president, dies aged 93 - BBCWeinbaum noted that millions of Ukrainians had fought against Nazism. "Millions of Ukrainians fought in the armies against the Nazis. And we also have to remember them," he said adding that there were also some local people, who played a negative role, contributing to the worsening of the situation. According to Weinbaum, it is necessary to understand the complex historical legacy. "This is a process that will probably take a very long time. Generations will pass before it is possible to see if there are developments in Ukrainian society on the development and understanding of the situation," he said.